Flush or Panelled Doors – but they’re all doors, aren’t they? Posted August 20th, 2013 | Fire doors. As a door manufacturer it’s surprising how often we are asked to explain the difference between flush and panelled doors. The question comes from a variety of sources, such as architects, contractors and developers, and it can be difficult to know which one is best for a project if you don’t understand what distinguishes one type of door from another. It’s easy to think that they’re all doors and that they all do the same thing. But in truth, flush and panelled doors have many differences and it’s important to choose the right product for each situation. In this blog post, we’ll explain what makes flush and panelled doors different and the reasons you might want to choose one over the other. 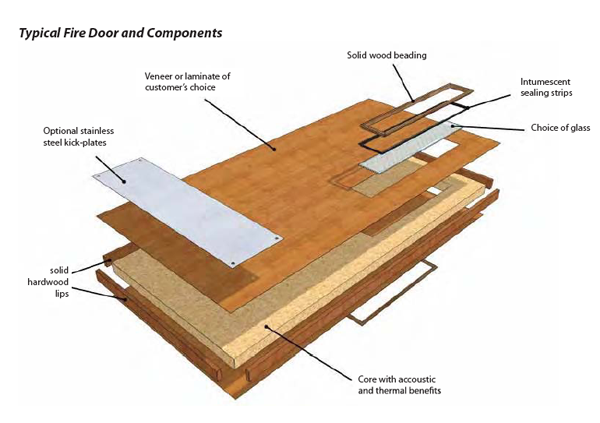 This explanation will cover the performance of timber flush and panelled doors only, although both types of door can be made from other materials, such as steel or fibre glass. Panelled doors, or traditional joinery doors, have a long history. They have been around for millennia and are made from components – rails, stiles and infill panels – that are assembled to create the door. Flush doors are of much more recent origin. Indeed, they are essentially a post-war product. They are basically a slab of material and when performance doors are required, they include a core of solid material. These solid cores are generally particleboard or laminated timber, which can be faced with sheets of plywood or MDF to provide a flat surface that can be painted, veneered or faced in laminate. The edges are usually lipped with hardwood. The diagrams below illustrate typical constructions for panelled and flush doors. Recent technical developments by the two leading particleboard manufacturers, Strebord and Halspan, have provided specifiers with alternatives to traditional panelled door construction, but derived from flush door principles. This means it is possible to manufacture flush doors that look like panelled doors with timber veneers. The result is high-quality performance and appearance at an affordable price and supported by comprehensive testing. So when do you choose a panelled door or a flush door? And what things should you consider before specifying one? The main factors to think about are: appearance, performance and application. Where new doors are required for existing buildings it is likely that the existing style of door will determine the appearance of the new doors. Therefore, a heritage building with traditional panelled doors would be expected, in all probability, to receive bespoke new doors to match the original while also providing modern features like fire resistance. To achieve this, details of existing doors – mouldings, rail and stile dimensions for example – can be taken to provide exact replicas. Flush doors, which tend to be cheaper than panelled, are more modern in appearance. They tend to suit buildings with specific functions like schools, hospitals or offices, where high levels of fire resistance, sound attenuation and impact resistance (laminate faced doors) are often essential. Typically flush doors perform better for fire resistance, sound attenuation and impact resistance, which are often key specification considerations on large commercial, educational or hospital projects. In recent years, more sophisticated fire resisting panels have been developed by companies specialising in engineered timber products, making it easier to manufacture a flush door to meet the required standards. Whilst it’s possible to achieve performance levels with panelled doors that match those of flush doors, this is generally limited to lower performance levels. Panelled doors are technically more difficult because of the nature of construction – they require more detailing like moulding and beading in areas where the panels themselves meet the structure of the door; this work can be complex. Panel construction for fire doors has traditionally used a ‘sandwich’ method, with fire resisting board materials, such as Supalux or plasterboard providing the filling. Panelled doors are typically chosen for heritage or listed buildings where doors need to complement the existing building or meet certain planning guidelines. In some cases bespoke panelled doors are required to match pre-existing doors – whether flat or raised & fielded panels. The use of panelled doors can allow a listed or period building to retain its traditional heritage integrity whilst ensuring that modern fire resisting and acoustic requirements are not compromised. Flush doors can create elegant lines and simplicity in buildings where aesthetics are important. They can also perform to the highest levels of security, fire resistance and acoustic performance. The installation and maintenance requirements of panelled and flush doors are basically the same, so is unlikely to influence your decision one way or another. But no matter what type of door you choose for your project, the quality of the manufacture, installation and maintenance is critical. A door can only perform as well as it’s been installed, regardless of the quality of manufacture. Features like fire and smoke seals, hinges or closers (essential ironmongery) need to be properly maintained to prevent damage or other failures from compromising performance. You may want to consider third-party certification schemes, which are available for the manufacture, installation and maintenance of fire doors, such as those run by BM TRADA. If you’re looking for flush doors or panel doors, take a look at our product range to see what options are available. And please feel free to contact us if you have any further project enquiries.